Winsock2 Repair: When Winsock2 is damaged, the symptoms will be shown. 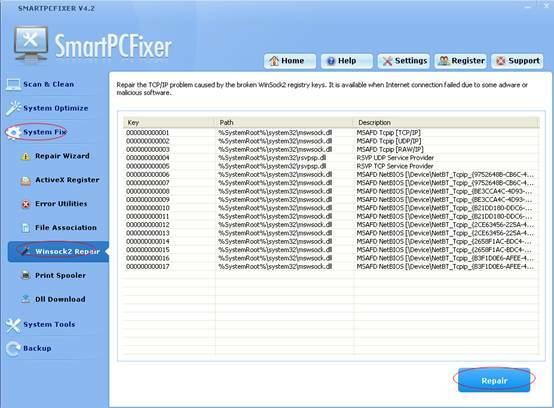 If you try to release and renew the IP address by IPCONFIG, use this tool to fix it and repair the TCP/IP problem caused by the broken Winsock2 registry keys. It can solve the problems such as the Internet connection failure induced by some Adware and malicious software. Click the System Fix button on the left side, and then click the Winsock2 Repair button. Read the error information and related description carefully.